Quality thinking matters as much as quality processes do, at every level of the organization. According to the Research Institute of America, ineffective thinking is at the root of 94% of what goes wrong in the workplace. Quality thinking is at the root of consistent quality results. If thinking skills are so important where do people learn them? Can effective thinking skills be learned? In 1977, Philips, the Dutch multi-national electronics firm, initiated the Deva Project to find better ways of understanding and harnessing the thinking of their R&D staff. Deva is a Dutch phrase for "skillful thinking". Philips' business need was to bring better products to market more quickly. The project goal was to improve corporate performance worldwide by developing a generic, easy to learn, practical thinking skills system for universal application across their R&D community. The project team was made up of Philips scientists, managers and an external consultant, Jerry Rhodes. The team did four years of intensive empirical research and continual trial applications with scientists, managers, and technicians in the work place. By 1981 they had developed a business-based map of the mind at work and an advanced system of conceptual tools to improve performance and productivity. Rhodes and his associates at Philips identified three primary types of thinking and 25 precision conceptual competencies. These 25 conceptual operations are the generic thinking tools that we use everyday to think, innovate, manage situations, solve problems, deal with conflict, serve customers and get work done. Like the letters of the cognitive alphabet, once learned, they can be used as a universal system for handling any task that requires our best thinking. The triumph of the work of the Philips' team was their ability to transform their research on how the mind works into a practical, business-based system to improve performance. Rhodes called his system Effective Intelligence. He has written two books on his work. Each of the three thinking styles represents a specific underlying driving force that influences and shapes action. Dr. Robert Sternberg, IBM Professor of Psychology and Education at Yale University, a distinguished pioneer in the thinking styles field and author of Successful Intelligence has described the same three types of thinking as essential to personal effectiveness. His ongoing work confirms the earlier research findings at Philips. Rhodes system divides the three primary types of thinking into two categories, a hard and a soft mode for each. Hard thinking is that objective, tangible, impersonal, and outward looking. Soft thinking is more subjective, intangible, personal, and more inward looking. With training a person can become more adept at identifying, selecting and using the appropriate thinking styles to manage any situation, person or group. Judgmental thinking is represented by the color blue. This form of thinking is used to make up one's mind about what to do, to form an opinion, or to make a decision. The focus of blue thinking is on practical, action-oriented decision-making. Its motivation is to cut through the volume of information to arrive at what really counts. Blue uses logical reasoning, as well as personal evaluation to form judgments on what is "the right thing to do". It is convergent, moving to the single point where a decision can be made. Blue is where you get things done, when you commit to action. Blue evaluates, uses past experience, and interprets events. Blue likes to determine what should be. The hard blue thinking style is logical. It looks for sound reasoning, proof, and evidence. Hard blue needs to be convinced of the rationale before it decides to go ahead. Soft blue thinking focuses on values and personal preferences as ways to determine the right thing to do. In soft blue, thinking is driven by enthusiasm and the need to make things happen. By shifting to soft blue, you commit to action. Descriptive thinking is represented by the color red. When in red you are seeking the truth. You want data and facts. The red form of thinking is analytical, focusing on information through sorting, classifying, categorizing, and organizing. Red is also the color of communication. When in red you connect with others. You observe what is going on, and seek to understand others, again in order to find the truth. Red likes to describe what is or was in a neutral, non-judgmental way. The hard red thinking style is analytical. Here one wants to collect and organize all relevant facts and data with precision and accuracy. Hard red likes to find the truth within both the small and large contexts. Soft red thinking is impressionistic, concerned with the qualitative side of the truth. It is sensitive and tuned-in. In soft red you take care to communicate and connect with others in a way that works for them. Creative thinking is represented by the color green. Ingenuity, ideas, imagination, and intuition all characterize green thinking. When in green you like to be on the cutting edge of whats new. Green thinking is divergent, generating many ideas and options. It wants to explore new paths and opportunities, and challenge the status quo. Green focuses on what could be. The hard green thinking style is ingenious. It likes to look for new ideas, different approaches and unusual options. Hard green is lateral thinking. It likes to find a way around obstacles (or rules), and reframe problems into opportunities. The soft green thinking style is imaginative. It seeks breakthrough insights. It uses analogies, metaphors and intuition. It is used to create scenarios about the future. "Although people will usually have a preferred style of thinking, they do not, of course, use only one style exclusively. In everyone, there is some combination of analytical, creative, and practical intelligence." Robert J. Sternberg. The Rhodes' Thinking-Intentions Profile or TIP, is an inventory of 24 questions that shows an individual's thinking preferences. Scored by participants while in the learning environment, the Rhodes' TIP is used as the starting point to generate awareness and understanding of an individual's preferred thinking styles, i.e. how one likes to approach a task or situation. It is these underlying thinking preferences that govern behavior. In 1991 the Centre for High Performance brought Rhodes system under license to North America and renamed it SmartSkills, while molding it to the distinct characteristics of the North American business and cultural environment. The Centre also developed a range of practical job-aids to reinforce the application of quality thinking in the workplace. To date the Centre for High Performance has accumulated data on the thinking styles of over 15,000 people in the North American workplace. The database includes over 5000 profiles on people from more than 150 organizations who have employed the SmartSkills methodology. Certain patterns on the thinking preferences of North Americans are emerging. The results show that overall we prefer the comfort of Blue and the realism of Red more than the creativity of Green. However, a closer look at the data, displayed by function in the organization shows some intriguing differences. It suggests a certain ecology of thinking -- a fit between the type of thinking one prefers and the types of thinking required by the work one does. While individuals differ considerably within job categories, it is not surprising that executives should have larger amounts of Green. A key role they have to carry out is to create the future for their companies. The data also suggests that adaptation to change and the rapid flexibility needed for today's business challenges can be difficult for many in the work force who do not like to think that way. To tap the latent intelligence in an organization, a critical first step is to inventory the types of thinking styles available and then to act strategically in the management of this resource -- training, optimizing and leveraging these pools of intellectual capital to meet business objectives. Personal Effectiveness. SmartSkills one and two-day programs are integrated into corporate training curriculum. IBMs award winning manufacturing plant in Toronto, for instance, had all 1,000 people go through the course to improve personal effectiveness. One-to-One Relationships. Polaroid is using the Rhodes' TIP as part of a one-to-one coaching initiative with their high performers. Team and Meeting Productivity. The Rhodes TIP Profile brings to light the cognitive style diversity within teams, and points out the range of thinking styles available. It aids in identifying critically missing thinking styles, and team members recognize and capitalize on the diversity and strength of the others in the team. Astra USA, for one example, used SmartSkills as the operating framework for a two-day multi-stakeholder team planning session with 25 representatives from ten countries. Task Analysis. Quality thinking is at the root of every effective quality process, and knowledge of cognitive styles can be used as a framework for quality assuring the thinking in any work flow process. With SmartSkills employed as the task analysis platform for cross-functional teams, the City of Etobicoke restructured the delivery of quality customer service while facing a major downsizing. Organizational Applications. Shell Canada is using SmartSkills as a common platform in leadership development, team training and in improving the quality of problem-solving. With an internal team of SmartSkills trainers, Shell has integrated the system in a wide variety of settings across the corporation. Intelligence is emerging as an organization's most valuable and underutilized resource. The ability to recruit intelligence, to map it, and to leverage it provides a distinct competitive advantage. Organizations which nurture quality thinking, develop a portfolio of diverse cognitive styles, and create a culture which values and respects the contributions of everyone will succeed. Please visit our web site where you can learn more about the Centre and what we do, the tools we have created for profiling and leveraging personal thinking styles, and our intranet-based collaborative technology. Kimball and Fisher (1998), The Distributed Mind, Amacom. Rhodes, J., & Thame, S. (1988), The Colours of Your Mind. Glasgow: William Collins Sons & Co.
Rhodes, J. (1991), Conceptual Toolmaking. Oxford: Basil Blackwell, Ltd.
Sternberg, Robert J. (1996), Successful Intelligence, Simon & Schuster. Would you like to offer some thoughts or add to the dialog? Responses of general interest may be posted below. Send your comment to . IMPORTANT: Make sure the subject line of your message contains: Comment on Guest Speaker 4/98. Bob - I thought the profile in your data base of thinking styles in job functions was quite interesting. You say "It is not surprising that executives have a large amount of green." It was surprising to me, and feels uncomfortable. My first reaction is to think that the "average" executive is a stick-in-the-mud, having gotten to the position by learning how to conform to the corporate system in today's "average" company. I haven't witnessed a predominance of "effectively" creative thinking there. Your data base speaks to averages and I'm speaking averages here, I know and respect many exceptions. So this wants to tell me I am wrong with my gut feel - though it would be enlightening to see the profile of company type represented - small/large, old/new - something like that. On second thought, perhaps the companies and people that are drawn to your work are self selected in the creative arena - perhaps this is the data base skew? 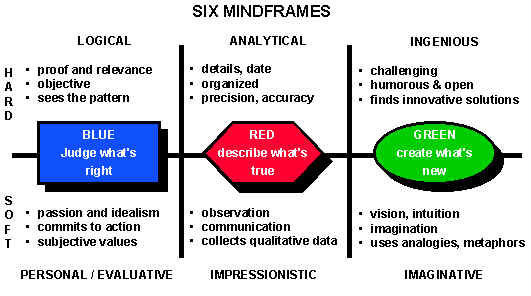 True, many individuals that I have worked with have exhibited high degrees of blue - the "I know what's right and that is what you are going to do" - and some, fewer in number in my experience, have exhibited high degrees of red - a need to understand, analyse and study, versus a penchant for the creative or the need to act. However, our results continue to show that people in the highest ranks contain individuals who do have a predisposition for the future, for what is new and a drive to explore and develop that future. As Gary Hamel and C.K. Prahalad have pointed out, if these folks at that level aren't creating the conditions for future success and making the decisions to ensure that future , who is? My belief is that, using the SmartSkills model of effective intelligence, we manage with our hard thinking and we lead with the so called soft style of thinking. By that I mean managers need the logic of hard blue, the analysis of hard red and the abundance of creative ideas in hard green to be able to make the day to day decisions. Leaders however, or when we adopt the leader role, must inspire and move people to build and aspire to the future. This means using the inspiration of the vision of the desired future in soft green, the ability to connect and communicate the inherent truth of that vision to the various and sundry stakeholders in soft red in ways they will relate to, fuelling the whole initiative with the power of their belief system and their personal integrity in soft blue. It isn't one versus the other - it is the need to embrace all dimensions to be effective. What are the new criteria for identifying the type of thinking needed at the executive level? No easy answers. It also depends on the stage of development of the company. Different thinkers needed for different times! Maybe it is time to revisit our own mental models about who occupies the executive suite. Read two great new books that are grappling with the emerging business paradigm shift - The Individualized Corporation by Sumantra Ghoshal and Christopher Bartlett (Harper Business) and The Centreless Corporation by Pasternack and Viscio from Booz Allen. These guys are spotting what the most successful corporations are morphing into, and there is one hell of a lot of green thinking going on in the radical creation of new forms of business design. My experience also is that those executive teams that function the best have a range of diversity - that is cognitive style diversity - a healthy blend of all three of the primary styles of thinking. Question: If the executive ranks show a predominant leaning toward "green" creative thought does this account for the unwillingness to let go and empower others? Would it be more useful to have a predominance of analytical "red" with reasonable amount of judgmental "blue" and creative "green" if the aim is to have an empowered workforce that pursues the objective set by the executive ranks? What say you? I have just reviewed the updated data base result on May 1, 1998. With over 5000 people entered, all of whom work in organizations, and primarily large organizations, the number of executives in our sample is 407. The results consistently show that although within the executive ranks the differences between the thinking styles is not great, green or creative thinking is still the most preferred. In fact, in green, one is more likely to empower others than in the other styles. My experience, after working with hundreds of organizations, is that the leader of the new millenium needs to have a combination - soft green - imaginative thinking to have the foresight to see the future, the soft red to understand the people and the world around him or her, and the predisposition to communicate effectively with others and the hard blue logic needed to make sensible decisions. As a leader much of the passion, hard red analysis and the hard green creative ideas can and should come from others. The leader's job is see the future, create the conditions inside to ready and align the organization, then make the decisions to give people the go ahead to make it happen. The overall point of this SmartSkills system is that to be effective, one needs to have all types of thinking at their disposal. Then the key is to do the right type of thinking at the right time. The executives who are the most effective value the intelligence of each employee or associate. They know that no one type of thinking is the answer. They accept and value the diversity of intelligences They look to harness the intelligence of everyone in their organization. They accept that the fact that for their organization to succeed, they must create the conditions, systems and incentives for each of the types of thinking to flourish. All three types and all six mindframes are needed to make it work. Too high in blue means we know it all and we have trouble coping with fast paced change. Too much red, and decisions take too long, and there can be too much micro management. Too much green and all those good ideas never bear fruit. Ive been reading Jerry Rhodes book: "Conceptual Toolmaking", where he talks about 21 "Thunks" as the fundamental 21 thinking modes. I guess the 25 you refer to as coming from the original study have since been refined down to 21? In any event, have you or anybody else thought about or applied the 21 Thunks as tools to help the learning process - especially as tools to help teach people/kids how to learn? Can they be employed in the creation of the "agile learner", which was the subject of the previous Guest Speaker column here? More specifically, are you aware of any training courses or schools at any level that teach these thinking modes to students? Or continuing education programs that use this as a learn-to-learn tool? The 25 thunks are the key tools. There are 21 precision thunks or conceptual tools, organized into three categories. Each of these categories, green,red,blue, has a super thunk -go green, be red, do blue. The final super thunk is DO, the move to action. Add them up and you have the meta structure of effective thinking. These thunks should be at the centre of any curriculum on quality thinking. Like any set of power tools, once mastered you can use the same tools to build anything from a birdhouse to a mansion. Regarding the agile learner - the thunks are the core conceptual competencies that underpin all thinking. Using the right combination at the right time for the task at hand is the essence of effective intelligence. One of our licensees and one of my best buddies is David Gouthro from Vancouver. He has meet with Paul Messier and the NLF and talked about SmartSkills. Bob....I'm always interested in seeing personal preferences and skills from a new perspective. You have added an interesting new dimension based on a substantial amount of research. Have you had any opportunities to relate your taxonomy to MBTI or Social Styles? Thanks. Jake. Hi Jake, I work with Bob at the Centre. Yes, we have "colour-coded" both MBTI and Social Styles. I'll forward along to you an attached file with both comparisons. We look forward to your comments. by Jerry Rhodes .... as out of print, but they have a used for sale for $18.90. Otherwise, you might contact Larry Rhodes (chase him down on the Internet) and buy one from him. It is worth the effort.